Please also follow me on Instagram where I typically post new timelapses every week during blooming season. I post videos to IG first as IG limits there resolution, which means I can crank out something without too much super detailed editing vs. what’s required for the high res versions I eventually post at YouTube, Facebook and Vimeo. As you would guess, I’m EchinopsisFreak on Instagram (and on Facebook, YouTube, Twitter, and Vimeo as well). BTW … almost all my timelapses are available in resolutions up to 4K. I’m pleased to report they’ve been featured in displays at a number of botanic gardens, on TV and web programs, and have also been put to use by a number of advertisers (helping pay for my cacti/photography addiction). If your organization could use one or more of my timelapse videos in some fashion, please ping me via the contact page here at echinopsisfreak.com to discuss. Here are three videos that are compilations of some of my favorite timelapses. Hope you enjoy! Some additional animated GIFs … please do check out the videos at YouTube and Vimeo for the much higher quality. Here’s a look at my “studio” … really a bathroom that ceases use for it’s traditional purposes for the 7 or so months a year my cacti are blooming. You’ll note that I had dueling timelapses filming the evening the image was taken. Why can’t my cacti just make life easier and pick different nights to bloom? Here are some details on how I create my timelapses, should you be interested in trying your hand at it. It’s pretty easy and good fun. Camera: I use a Canon 6D full frame DSLR. It’s a wonderful camera. I actually have 3 of them at this point, so I can film up to 3 cacti blooming the same night which happens frequently during peak blooming season. Lenses: I use 2 lens almost exclusively … the amazing Canon 100mm Macro and the equally amazing Canon LS 35mm. Now much as I love my 6Ds and those lenses, they’re just personal choices and there are many, many fine options that will get the job done. Nothing unique about these choices, though I do have to say the lenses are both very sharp. Power: I use a/c power supplies on the cameras. Batteries will never last long enough. Intervalometer: You need these tools … one that’s compatible with the camera you use (if it doesn’t have a built-in intervalometer) … to take images ever X seconds or minutes. Again, check to make sure the one you get is going to be compatible with your camera. Tripod: Tons of options all good. Lighting: I use LED lights … big 500-led panels to provide overall lighting and smaller little LED desk lamps to spot flowers/areas. I get these lights at Amazon (well, I get all my stuff at Amazon) and they’re amazingly inexpensive. LED lights stay nice and cool, which is good as you can be shooting over multiple days. 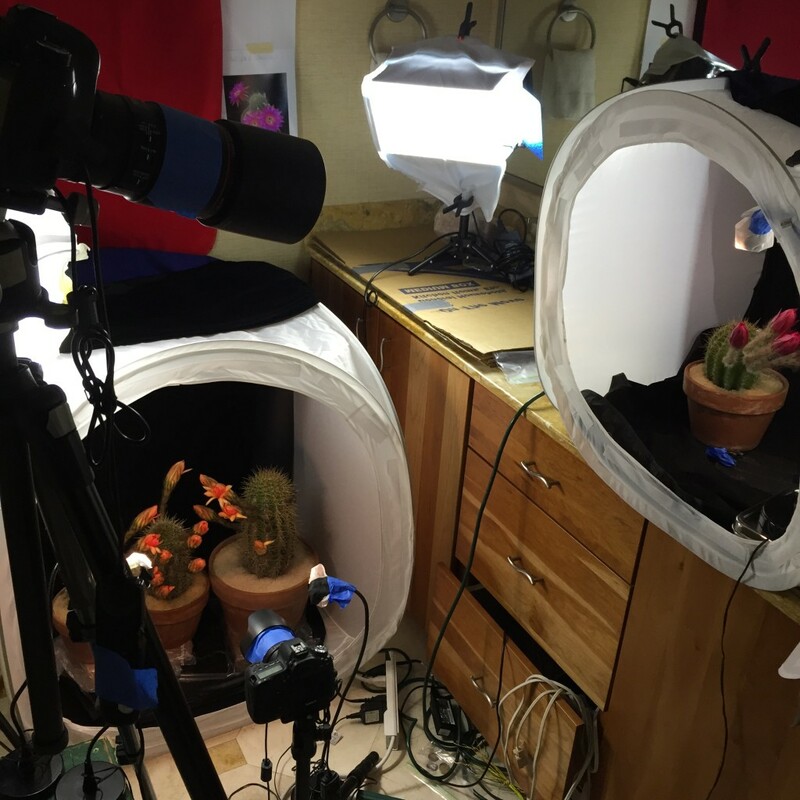 Shooting Tent: I bring the cactus that’s ready to bloom into my “studio” (which is a bathroom I use to shoot my timelapses during blooming season) and in the bathroom I have set up a photography tent with a black backdrop. You can see what this all looks like in the picture above. Okay, so that’s the gear. — Shoot RAW. Always. As you are very likely to already know, RAW stuffs away a wide range of data about each image you take, that allows you to make very significant edits after the fact. This flexibility is essential when shooting flower timelapses as the lighting situation changes as the flowers open. — Camera Settings: I shoot as the highest F# the lens offers to get maximum depth of field. That’s F32 on the Canon 100mm and F22 on the Canon 35mm I use. I then set ISO and Shutter Speed based on the lighting of the specific set up. I always start the shooting way underexposed as when the flowers open they reflect back much more light and you can end up with massively overexposed images that can’t be salvaged even when shooting RAW. — Time between images. I typically set the intervalometer to take an image every 40 seconds as the flower blooms. Cactus flowers bloom in about 10 hours. If you are shooting something that blooms slower or faster, I would adjust how often you shoot accordingly. Looking to end up with something like 1200-1500 images to use to create your video. If I am going to film wilting, which takes place over about 48 hours. I slow the timing down to 1 image ever 2 minutes. — I edit the images in Lightroom. — I then output JPEGs that I will use to create the video. — I turn the JPEGs into video clips using both Final Cut Pro and Photoshop.